Hello lovelies! Today I'm back with another super quick swatch, and again it's another old shade from Barry M. If you missed my swatch of the shimmery 'Tangerine' on Wednesday, you can find that post here. This time I have one of their limited edition shades from 2013, which has no name apart from 'BLE 2013'. 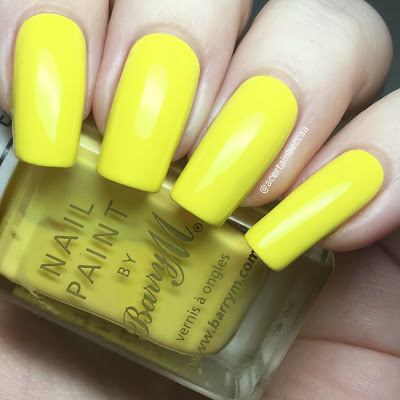 Read on to see my full swatch of this gorgeous yellow! 'BLE 2013' is a bright yellow creme. The formula is really smooth and easy to apply, and very surprisingly opaque for a yellow (especially an older one too!). I did find that it bubbled/separated weirdly on the first coat, most likely due to oil residue on my nails as I had no basecoat on. Without this I think it could have easily been a two coater. I did need a third this time to cover the small patches from the first coat. Below is three coats with topcoat. What do you think? I love a good bright yellow so this is right up my street! I also love the tribal patterned cap. I will have to try it out again in the future to see if it bubbles again, although I am pretty sure it was my own fault! Have you ever had that happen to you before?